TRIMS includes features which permit the use of Bar Code Scanners, Portable Data Recorders, Recording Time Clocks and Key/Card Fuel Systems. Print Inventory Bar Code Labels which identify the product, cost, vendor, and date of purchase. Automatically update your inventory by scanning the Bar Code Labels using a portable Bar Code Reader and uploading the information into TRIMS. Equipment Usage information can be recorded with a portable Bar Code Reader by scanning the Equipment Bar Code and keying in the current hour meter or odometer reading. Collect and Import information about Work Activities performed on Trees. TRIMS includes the Bar Code printing and data import functions described above. 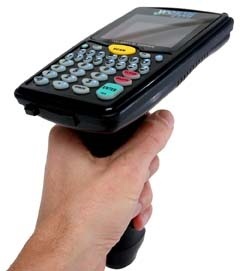 To make use of these features you will need a Bar Code Scanner or Portable Data Recorder which can be purchased from TRIMS or your local Bar Code equipment supplier. All Bar Code Equipment need a TRIMS Interface File installed in order to function propertly. Item shown is the TriCoder with integrated Laser Scanner & Ergonomic Gun.properly.